Here are a bunch of Cyber Monday Sewing Machine Deals that are going on now at Amazon, Sam’s Club, Walmart, and more! If you’re looking for Cyber Monday Deals on Sewing Machines then make sure you bookmark this page, I’ll be updating it all day Tomorrow and Monday with the best Cyber Monday Deals 2014! You can see all the Sewing Machine Deals here. Grab this Brother CS6000i Feature-Rich Sewing Machine at Amazon for only $143.99 Shipped, down from $449.99! That is a savings of 68%! Since this item is priced over $35, you will receive Free Super Saver Shipping or Free 2-day Shipping with Amazon Prime! Pick up this Brother Project Runway Sewing Machine for only $99 Shipped, down from $329! That is a savings of 70%! Since this item is priced over $35, you will receive Free Super Saver Shipping or Free 2-day Shipping with Amazon Prime! You can also get this Brother Project Runway 70-Stitch Computerized Sewing Machine with Wide Table for $129.99 Shipped, down from $349! Since this item is priced over $35, you will receive Free Super Saver Shipping or Free 2-day Shipping with Amazon Prime! You can also get this Singer Heavy Duty Extra-High Sewing Speed Sewing Machine for $118.18 Shipped, down from $249.99! Since this item is priced over $35, you will receive Free Super Saver Shipping or Free 2-day Shipping with Amazon Prime! Also, check out this Brother Computerized Sewing Machine ES2000, for only $99.98 + FREE Shipping at Sam’s Club! 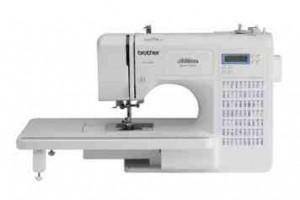 This product includes Free Shipping and is another great option if you are looking for the best prices on Sewing Machines! Here is the Brother Computerized 100-Stitch Project Runway Sewing Machine for $129.97 + FREE Shipping, down from $149.97! Grab this Sewing Machine now at Walmart!